FILE - Smoke rises from a building, where Taliban insurgents hide during a firefight with Afghan security forces, in Helmand province, southwest Afghanistan, March 9, 2016. 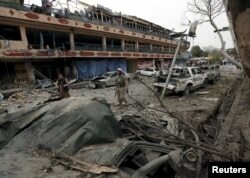 The United Nations said it expects more violence with the onset of spring in Afghanistan and called for increased regional cooperation and coordination to help the war-hit nation counter the terrorism threat. Traditionally, fighting subsides in Afghanistan during winter because heavy snow blocks the movement of insurgents through mountain passes. But Afghan officials and military commanders say because of a mild winter there was no let up in fighting in 2015. The U.N. reports there were more than 11,000 deaths and injuries to Afhgan civilians. “Afghanistan continues to face a difficult security environment with the presence of both indigenous and foreign terrorist groups, which we can expect to become more active with the onset of the spring fighting season,” warned U.N. representative to the country Nicholas Haysom while speaking at a regional counterterrorism meeting Sunday in Kabul. Without naming any country, Haysom said some terrorist groups operating in Afghanistan have their origin and destination outside the country and threaten the entire region. He acknowledged efforts the Afghan government is making by encouraging insurgents to join a peace process and by exercising military power against those refusing to quit terrorist attacks. An Afghan policeman inspects the site of a blast near the Indian consulate in Jalalabad, Afghanistan, March 2, 2016. “Apart from the fact that this problem cannot be resolved by one country by acting on its own it surely cannot be expected of Afghanistan to shoulder alone what is a regional phenomenon,” Haysom noted. Afghan officials have long maintained that leaders of the Taliban and other insurgent commanders are using sanctuaries in neighboring Pakistan for directing violence across the border. The Afghan intelligence chief told the national parliament last week that Pakistani spy agency is fully supporting the Taliban campaign, charges Islamabad denied as baseless and unfortunate. The Taliban has refused to engage in peace talks with Kabul and there are fears that an increase in insurgent violence in Afghanistan will fuel bilateral tensions with Pakistan. But Haysom emphasized the need for “effective joint action strategies” to deal with the threat of terrorism, saying the solution lies in developing regional consensus, cooperation and coordination by all countries in the region.